#Legumes4Africa is the theme for the Pan African Grain Legume and Cowpea Conference. It's focused on grain legumes because of their potential to play a significant role in delivering against the UN's new SDGs - especially Zero Hunger, Good Health & Wellbeing and Life on land. 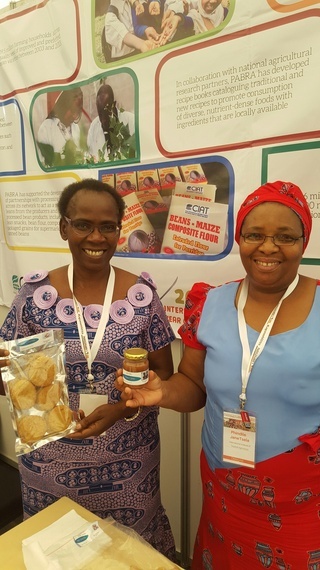 "Investments in pulses research have the potential for significant agricultural impact. The high nutritional value and climate resilience traits of pulses are well established to fight the global challenge of hidden hunger, poverty and environmental degradation, especially for the vulnerable populations of sub-Saharan Africa and Asia," says Shoba Sivasankar, Director, CGIAR Research Program on Grain Legumes. India the largest consumer and a major producer of pulses has recently introduced subsidies for pulse production in a move which some see as a pointer for other Governments. Director General of ICARDA Dr. Mahmoud Solh, a leader in international agricultural research said: "India should be commended for being the first country giving subsidies now to pulses also which is expected to change the picture". The Indian Government and others have also recently teamed up to launch a Global Pulse Research platform. "The platform will not only invest in the necessary research for new pulses technologies but also build the capacity of local scientists, extension workers and farmers, " according to Dr. Solh who calls pulses "climate smart crops" because they contribute positively to soil health. "The establishment of the Global Pulses Research Platform is a step in the right direction," Dr. Solh concluded. The Global Pulse Productivity & Sustainability Survey and #LegumesforAfrica both highlight a broad consensus among experts about the need and focus for research in a key 'orphan crop'. "With investment in crop improvement and agronomy research, pulses can be made resilient to climate change as well as diversify income sources for farmers. Focused research efforts creating expanded value-added marketplace for pulses will generate new market opportunities for farmers to make farmers prosperous as well as modernize our food system to become more sustainable, equitable and nutritious," says David Bergvinson, Director General, International Crop Research Institute for the Semi-Arid Tropics. This consensus is a 'Big Step' forward. But much still needs to be done. 'Pulse production is about half what it could be and storage problems still remain,' according to Ylva Hilbur, from the International Institute for Tropical Agriculture. ''Smallholder farm yields are about 2-3 times lower than they are on research stations so we need to focus on sustainable intensification of cropping systems,' says Jeffrey Ehlers of the Gates Foundation, whose single biggest investment in pulses is the Tropical Legumes III project. His point is backed by many other experts. By bringing together so many key people for the first time, #LegumesforAfrica has already achieved much. It could become a significant milestone on a journey to place pulses at the top of the political agenda for food security and nutrition. If Gavin Lubinda is right, we need it to be.